LLS Kickoff Event! Prizes, live music, and more! The Leukemia and Lymphoma Society has been an organization near and dear to our hearts at Independent Helicopters over the past several years, as they work to raise money and fight blood cancers. Their fundraising programs provide us with some really unique opportunities to turn our passion for aviation into something that unites people for a great cause (hello, helicopter paintball!). As many of you know, our very own Matt Taggard is launching his campaign for LLS Man of the Year next week. 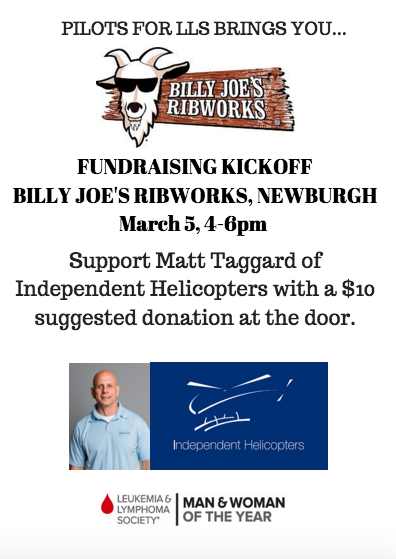 Next Friday, March 5th we will be kicking off at Billy Joe’s Ribworks in Newburgh and auctioning off various prizes! Stop by from 4-6pm for free food, a chance to donate to Matt’s campaign and win Helicopter Paintball tickets. Also enjoy live music with Jared Funari and a chance to experience “Behind the Bar” at Billy Joe’s. A suggested donation of $10 at the door will go towards Matt’s LLS campaign. First 20 people will receive a complimentary gift bag! We hope to see you there!